Inflammatory disorders underlie varieties of human diseases. San-Huang-Xie-xin-Tang (SHXXT), composed with Rhizoma Rhei (Rheum palmatum L.), Rhizoma Coptidis (Coptis chinensis Franch), and Radix Scutellaria (Scutellaria baicalensis Georgi), is a famous formula which has been widely used in the fight against inflammatory abnormalities. Mutual reinforcement is one of the basic theories of traditional Chinese medicine. Here this article reviewed and analyzed the recent research on (1) How the main constituents of SHXXT impact on inflammation-associated signaling pathway molecules. (2) The interaction between the main constituents and efflux pumps or intestinal transporters. The goal of this work was to, (1) Provide evidence to support the theory of mutual reinforcement. (2) Clarify the key targets of SHXXT and suggest which targets need further investigation. (3) Give advice for the clinical use of SHXXT to elevated the absorption of main constituents and eventually promote oral bioavailability. We search literatures in scientific databases with key words of “each main SHXXT constituent,” in combination with “each main inflammatory pathway target molecule” or each main intestinal transporter, respectively. We report the effect of five main constituents on target molecules which lies in three main inflammatory signaling pathways, we as well investigate the interaction between constituents and intestinal transporter. We conclude, (1) The synergistic effect of constituents at both levels confirm the mutual reinforcement theory of TCM as it is proven in this work. (2) The effect of main constituents on downstream targets in nuclear need more further investigation. (3) Drug elevating the absorption of rhein, berberine and baicalein can be employed to promote oral bioavailability of SHXXT. Inflammation, a complex response triggered by pernicious stimuli like pathogens or irritants, verified to be involved in process of many diseases such as Alzheimer Disease, type 2 diabetes, rheumatoid arthritis, etc., (Chiapinotto Spiazzi et al., 2015; Garimella et al., 2015; Saito et al., 2015). Generally, inflammation is classified as acute and chronic type. Acute type only last a few days with neutrophil infiltration, while chronic type can last up to years with infiltrations of lymphocytes and macrophages (Ambrozova et al., 2016). 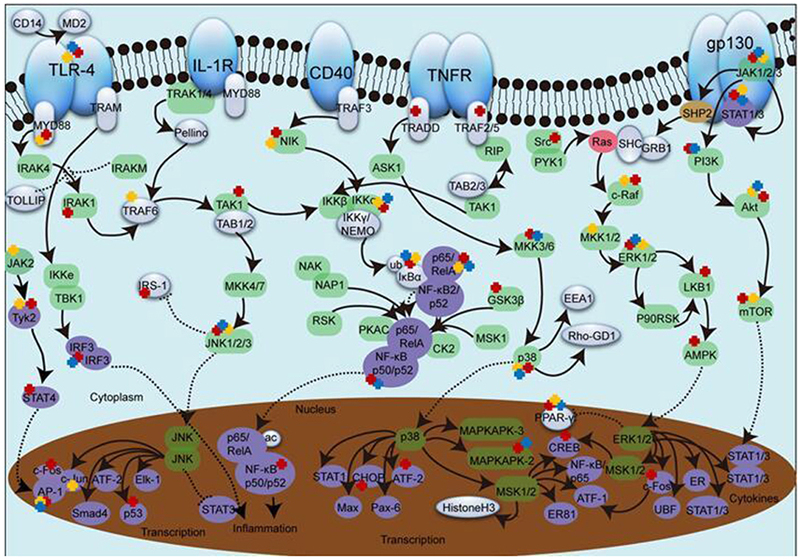 Inflammatory pathways perform a crucial part for signal transduction and recent research provide genuine evidence showing NF-κB, MAPK and JAK/STAT are the three main pathways (Bertolini, 2012; Ottani et al., 2015). As a famous traditional Chinese medicine (TCM) formula which has been used for centuries, San-Huang-Xie-Xin-Tang (SHXXT) displays good curative activation in the treatment of inflammatory disorders such as atherosclerosis (Wang Y. S. et al., 2011), upper respiratory tract infection (Ma et al., 2009; Kim et al., 2014), diabetic nephropathy (Wu et al., 2015), gastritis, gastric bleeding and peptic ulcers (Lo et al., 2005), and these protective effects are correlated with reactions of weakening inflammatory by suppressing cytokine/chemokine production. SHXXT has a quite simple composition with only three herbals, namely Radix et Rhizoma Rhei (Rheum palmatum L.) [RR, yields anthraquinones like emodin(Emo), rhein(Rhe) and aloe-emodin (Aem)], Rhizoma Coptidis (Coptis chinensis Franch) [RC, yields alkaloids like berberine(Ber) and coptisine(COP)], and Radix Scutellaria (Scutellaria baicalensis Georgi) [RS, yields flavonoids like baicalin(Bai) and baicalein (Bae)]. Previous studies show the basic effective constituents of SHXXT responsible for the anti-inflammatory effect may be Ber, Bai, Emo, Rhe, and Aem (Ma et al., 2009), plus, Bae is considered as a quality control indicator of RS (Zhang et al., 2013b). In regard of the bioavailability of SHXXT, A rapid and sensitive UPLC-ESI/MS method determined 17 active SHXXT constituents with good linearity in a relatively wide concentration ranges, among which, Bai is the most abundant. In bloodstream, the major forms of SHXXT include Bae, Emo, Aem and Rhe, while only the parent form of Rhe can be detected, and the conjugated effect may be accounted for their physicochemical property differences (Li et al., 2010; Shia et al., 2011). Intestinal transporters (IT), such as P-gp, MRP, BCRP (Sampson et al., 2015), SGLT1 (Asano et al., 2004) and OCT (Bader et al., 2014), play a critical role in the process of intracellular and efflux transport. Numerous evidence illustrate the main constituents in SHXXT are the substrates of efflux transporters which leads to a very low oral bioavailability (Huang S. et al., 2011; He et al., 2014; Wei et al., 2014; Di et al., 2015). However, most studies only concentrate on solitary constituent, whether they have mutual effect on respective absorption remains to be elucidated. There's growing evidence indicating that all those constituents above, while exclusively dosed, possess anti-inflammation effect by affecting a variety of target molecules in signaling pathways (Shih et al., 2007; Hamsa and Kuttan, 2012; Zhang et al., 2013a; Hu et al., 2014). We are all clear that, Chinese herbal combination should not only improve curative effects and reduce side effects, but also promote the mutual absorption of effective constituents. In this study, we review the recent studies and discuss how the three classic herbals of SHXXT, RS, RR, and RC, reach the goal of synergistic interaction at both pharmacodynamics and pharmacokinetic level. TLR-4 is the first described TLRs in mammals, it responds to LPS which can trigger NF-κB activation and pro-inflammatory cytokines secretion (Lee et al., 2010), constituents that can block the binding between TLR-4 and LPS are supposed to be valued in inflammation treatment (Wu et al., 2016). As summarized in Table 1, It is reported that Ber, Bai and Rhe exert inhibitory effect on TLR-4 expression in varies of models (Lee et al., 2010; Li et al., 2011; Cabrera-Benitez et al., 2012; Hou et al., 2012; Chen C. C. et al., 2014; Chen et al., 2015), and the combination of TLR-4 and LPS is observed to be blocked by Ber (Jeong et al., 2014). So, it seems that the anti-inflammatory mechanism of SHXXT begins at a really early stage, ever since LPS are interacting with upstream membrane protein. Table 1. Effect of the active constituents on molecules in NF-κB pathway. It has been identified that, MyD88 is recruited by TLR4 at plasma membrane to stimulate the initial activation of IKK, and it may be responsible for the early peak in NF-κB activity (Cheng Z. et al., 2015). Apart from MyD88, there are many other adapter molecules (such as TRAF3, TRAM and TRADD) sharing similar activity. NIK will promote NF-κB activation once combined with TRAF2 (Lee et al., 2014). Among them, MyD88 has been most systemically studied both in vivo and in vitro. In respect of these adaptor molecules, Ber and Bai negatively regulate their protein expressions (Pandey et al., 2008; Hou et al., 2012; Lim et al., 2012; Chen C. C. et al., 2014; Feng et al., 2014; Wan et al., 2014), however the main constituents from RR are rarely mentioned. Enzyme complex IKK (α-γ) have a crucial role in regulating NF-κB signaling pathway (Bagnéris et al., 2015). In general, IκBα forms a heterodimer with p65 (RELA) and p50 (NF-κb1), making NF-κB sequestered in cytoplasm. Once activated, IκBα goes phosphorylated meanwhile p65 is liberated and translocate into nuclear, which leads to gene transcription (Pandey et al., 2008). Depicted in Figure 1, the majority of current studies focus on upstream molecules from IKK to p65. Data in Table 1 show the main constituents of SHXXT can inhibit (1) the expression and phosphorylation of IKK, (2) the expression, phosphorylation and degradation of IκBα, (3) the expression, phosphorylation and translocation of p65 and (4) the expression, phosphorylation, DNA banding and activation of NF-κB in multiple in-vivo and in-vitro models, such as mesangial (Jiang et al., 2011), RAW264.7 (Fan et al., 2013), MEC (Yang Z. et al., 2014) etc., and ARD rats (Wan et al., 2013), C57BL/6 mice (Wang W. et al., 2015), DBA/1 mice (Hwang et al., 2013), etc. Figure 1. The effect of SHXXT alkaloids on inflammatory pathway molecules. 1. The green ellipse represents kinase. 2. The purple ellipse represents transcription factor. 3. The red ellipse represents GTpase. 4. The brown ellipse represents phosphatase. 5. The solid arrow represents direct stimulatory modification. 6. The dotted arrow represents translocation. 7. The dotted “T” represents direct inhibitory modification. 8. The red, yellow and blue cross represents the target influenced by RC, RS, and RR constituents, respectively. We know that, GSK3β is not active until dephosphorylated, and the activation will promote inflammation process undergoes Alzheimer Disease and diabetes (Venna et al., 2015). IRF3 is a target of TLR-4 signaling pathway, acting as regulating and activating the transcription of interferon which results inflammatory responses (Cheng B. C. Y. et al., 2015). Briefly, phosphorylation of these two downstream molecules are both identified to be reversed by Ber or Rhe treatment in either animal or cell inflammatory model (Amasheh et al., 2010; Li et al., 2012; Yuan et al., 2015), which cover the effect shortage of RS constituents at this part. MAPK can be divided into several subfamilies including p38, ERK and JNK (Lou et al., 2011). Upstream TAK1 forms a complex consist of TAB1, TAB2, and TRAF6 and then sequentially activate MKK and JNK. The presence of Ras will activate c-raf, MEK and ERK, followed by c-fos regulation once transported into nucleus. Subsequently, the regulated c-fos recruits c-jun to form AP-1 complex (Figure 1). 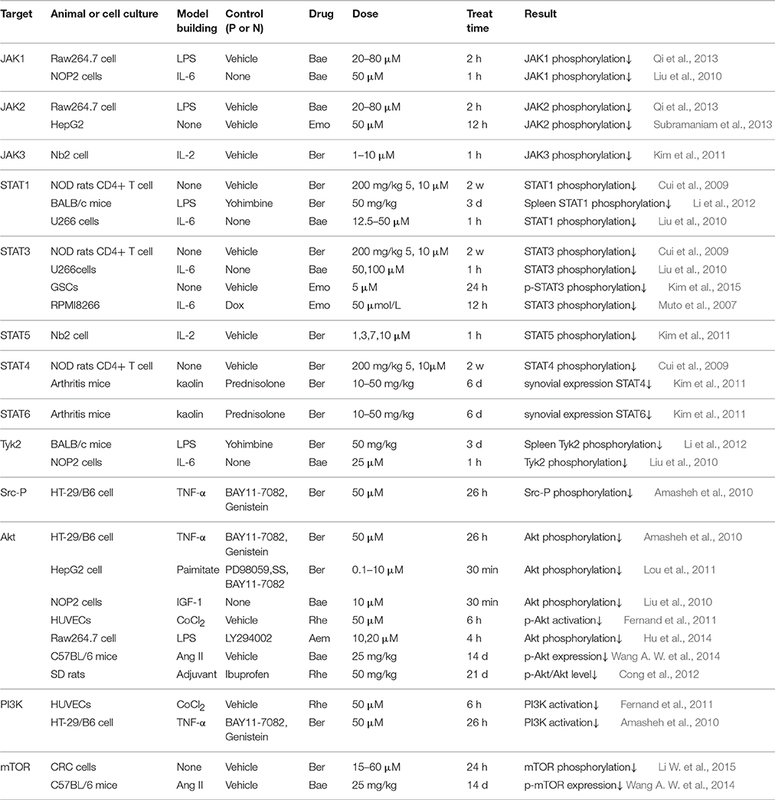 Accumulative data shown in Table 2 leads to a conclusion that p38, ERK, and JNK attract the most focus of study in MAPK pathway. 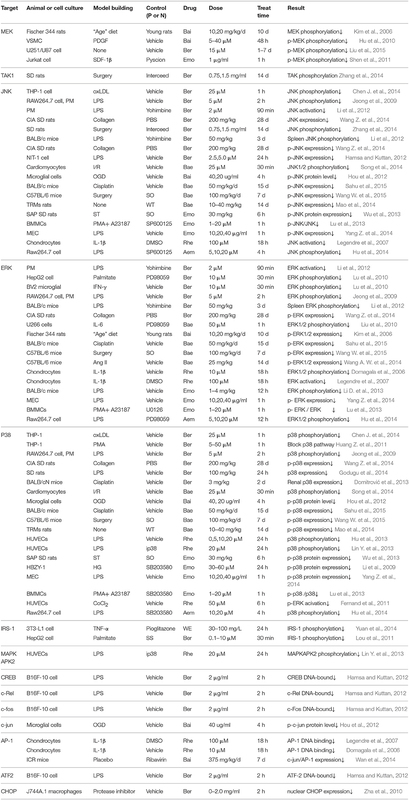 In-vitro study results reveal that the increased level of p38, ERK or JNK phosphorylation stimulated by cytokines/chemokines like LPS (Lin Y. et al., 2013), IL-1β (Legendre et al., 2007), oxLDL (Chen J. et al., 2014), PMA (Huang Z. et al., 2011), ischemia (Song et al., 2014), OGD (Hou et al., 2012), HG (Li et al., 2009) and CoCl2 (Fernand et al., 2011), or in-vivo elevated level induced by insulin (Lu et al., 2010), collagen (Wang Z. et al., 2014) and cisplatin (Sahu et al., 2015) can be significantly attenuated by either RR, RC, or RS constituent intervention. To further investigate whether p38, ERK and JNK are the only targets, molecules lied on the upstream and downstream are taken into consideration. Turns out, Ber, Bai as well as Rhe treatments all show inhibitory effect on MEK phosphorylation (Shen et al., 2011; Lim et al., 2012; Liu et al., 2015). Nevertheless, for the enhanced phosphorylation of TAK1, Ber is the only reported SHXXT constituent (Zhang et al., 2014). In addition, Ber, Bai, or Rhe also display markedly suppressing effect on endonuclear translocation factors like c-fos and CREB (Hamsa and Kuttan, 2012), c-jun (Hou et al., 2012), ATF-2(Legendre et al., 2007), CHOP (Zha et al., 2010), or AP-1 complex (Domagala et al., 2006). Table 2. Effect of the active constituents on molecules in MAPK pathway. AMPK serves as a cellular energy sensor to modulate lipid metabolism, and it can be activated by upstream kinases like LKB1 and CaMKK (Yang Y. et al., 2014; Li N. S. et al., 2016). There is a mechanism underlined the relationship, thus once AMPK activated, the nuclear translocation of Nrf2 is promoted, which contribute to the diminution of pro-inflammatory cytokines production. Nrf2 can also drive downstream HO-1 expression in with the considerable beneficial protect effect against cell injury from inflammatory response like diabetes mellitus (Agca et al., 2014). PPAR-γ is identified as a primary regulator of gene expression for inflammation and a pharmacological receptor of insulin-sensitizing drugs (Choi et al., 2014). 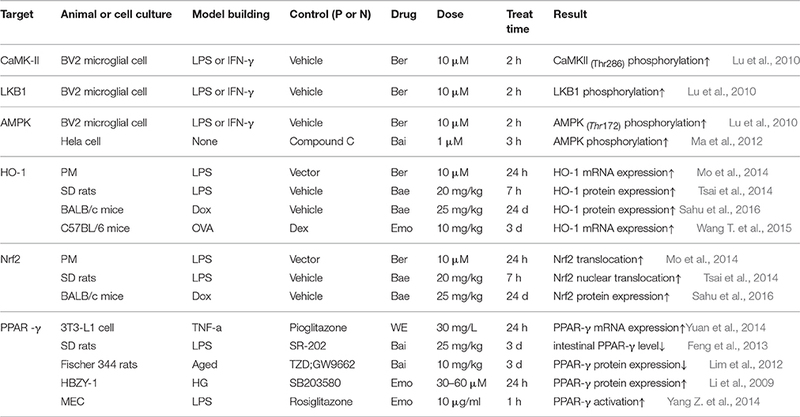 As summed up in Table 3, the current study status demonstrate that Ber from RC exert the most comprehensive effect compared with other constituents form RR and RS, pathway molecules from upstream to downstream, including CaMKII, LKB1, PPAR-γ (Legendre et al., 2007), AMPK (Lu et al., 2010), Nrf2 and HO-1(Mo et al., 2014) are all verified to be the effective targets of Ber. In addition, Emo (Yang Z. et al., 2014; Wang T. et al., 2015), Bai and Bae (Lim et al., 2012; Ma et al., 2012; Feng et al., 2013; Tsai et al., 2014) as well affect some of those molecules. Given this investigation situation, it seems that constituents from either RR, RS, or RC can block AMPK pathway by cross-talk regulating pathway molecules. Table 3. Effect of the active constituents on molecules in AMPK pathway. The activation of JAK catalyze Tyr phosphorylation so that STAT can be combined with receptor protein, then transported into nucleus to regulate transcription. It has been reported that STAT1 and STAT5, the downstream molecules of IFN-γ, are also likely to be implicated in inflammation (Chmielewski et al., 2015; Li X. et al., 2015). Akt functions as emerging crucial regulator of multiple cellular processes, such as apoptosis, differentiation, survival, etc., (Piao et al., 2015). Moreover, recent studies indicate PI3K/Akt can lead to an elevated expression level of COX-2 and iNOs in inflammatory macrophages (Liou et al., 2014). Further activated mTOR can regulate cell growth, differentiation as well as transcription and it tends to perform abnormally in diabetes models (Hua and Hu, 2015). For JAK/STAT pathway, constituents from RC, RS and RR are all showing inhibitory activity, typical targets include JAK (Kim et al., 2011; Qi et al., 2013; Subramaniam et al., 2013), STAT (Cui et al., 2009; Liu et al., 2010; Kim et al., 2015) and Akt (Lou et al., 2011; Hu et al., 2014; Wang A. W. et al., 2014), all of which are proved to be influenced by Ber, Bae, Bae, Emo or Aem in either in-vivo or in-vitro models (Table 4). On the other hand, results in the study concerning about downstream molecular present main RR constituent's effect-weakness on targets like Tyk2. Apparently, RS and RC cover the shortfalls of RR's poor activity in downstream pathway, which partly supports the synergistic theory of drug combination aiming at promoting curative effect. Table 4. Effect of the active constituents on molecules in JAK/STAT pathway. Traditional Chinese medicines are frequently orally administrated and the absorption of active constituents are confirmed to be influenced by efflux pumps and intestinal transporters (ITs) (Park et al., 2012; Zumdick et al., 2012). In general, ITs widely distribute in intestinal membrane and can be divided into two categories. One accounts for external substance's intracellular transport, such as OCTs and SGLT1 (Moran et al., 2014; Couroussé and Gautron, 2015). The other one, like P-gp, MRP and BCRP, is functioning as efflux pump to make drug or toxin back to lumen (Yamagata et al., 2007; Juan et al., 2010; Zeng et al., 2015). There are many isolate reports showing SHXXT's main constituents have an unexpectedly low concentration in plasma with oral administration, making it challenged to explain its positive effects in inflammatory therapies. In-vitro research on the efflux pump and ITs normally use Caco-2 cell or MDCK cell for they both have similar structure of differential intestinal epithelial cell with apical side and basolateral side (Chen et al., 2013; Schexnayder and Stratford, 2015; Obringer et al., 2016). Currently, it is verified that Bai from RS is the substrate of both MRP2 and BCRP (Kalapos-Kovács et al., 2015), and another RS constituent Bae is also pumped out by MRP (Zhang et al., 2007). Rhe, Emo and Aem from RR are substrate of BCRP, MRP and P-gp respectively (Wang J. et al., 2011; Liu et al., 2012; Ye et al., 2013), those ITs at least partly reduce the bioavailability of SHXXT constituents by diminishing their intracellular transport. Similarly, the absorption of Ber, Pal, Cop and Jat form RC is reported to be promoted by OCTs while inhibited by P-gp (Chen et al., 2008; Zhang et al., 2011; Sun et al., 2014). In addition to OCTs, SGLT1 also contributes to uptake (Zhang et al., 2012). 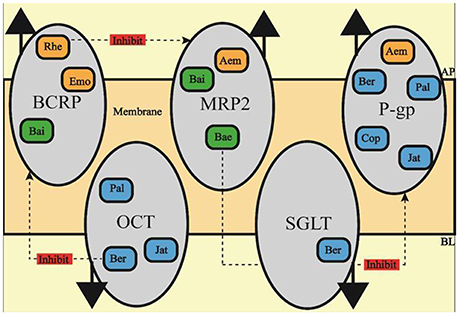 Thus, any constituents in SHXXT which suppress the MRP2, BCRP, and P-gp activation or, on the other hand, up-regulate OCTs and SGLT1 activation may be considered to exert mutual reinforcement property by promoting bioavailability. In return, constituents in SHXXT show retroaction on those efflux pump or ITs. Depicted in Figure 2, Firstly, P-gp, which reduces the absorption of Ber, Pal, Cop, Jar, and Aem, is proved to be inhibited by Bae treatment (Cho et al., 2011). Secondly, Rhe can suppress MRP's activation which may lead the increasing uptake of Aem, Bai, and Bae (Shia et al., 2013). Last but not least, Ber can as well decrease BCRP activation, which is capable of promoting the intracellular concentrations of Bai, Emo, and Rhe (Tan et al., 2013). Figure 2. The effect of SHXXT constituents on ITs. Ber, berberine; Cop, coptisine; Pal, palmatine; Jat, jatrorrhizine; Bai, baicalin; Bae, baicalein; Emo, emodin; Aem, aloe-emodin; Rhe, rhein. TCM normally used as prescription so as to recruit active contents from different herbals. Modern mutual reinforcement theory believes pharmacodynamics effect after herbal combination is not simply equal to the summing up of each herbal, but to a certain extent, should be more than that. Under most circumstances, a prescription can bring out more advantages in regards of safety and efficacy aspects than a single herb does (Song et al., 2013). Apart from expanding effect on one specific part, the combination of several herbals can also give rise to respective effect on different parts, which in other words, supplement other herbals' disadvantages or helping other herbals to perform their property in a better way. (1) Ber from RC is reported to affect TAK1 and interaction between LPS and TLR-4, while RR and main RS constituents barely mentioned. (2) Bae from RS and Ber from RC inhibit Tyk2 phosphorylation, while no main RR constituent has similar effect. (3) Rhe from RR and Ber from RC reduce IRF3 phosphorylation level, while the effect of main constituent of RS isn't that clear, etc. The connotative meaning of synergism at pharmacodynamics level is to enhance the effect on a certain target, as well as to expand target-affecting scope, just like what SHXXT constituents have performed. As for the pharmacokinetic level, shown in Figure 2, Ber form RS, Rhe form RR and Bae form RC is capable of improving the uptake or reducing the efflux of constituents from the other composition, which ultimately reaches the goal of synergistically influence inflammatory processes and eventually make this formula's anti-inflammatory action stronger and wider. Nowadays, elevated attention has been paid to dose-effect relationship. There is a complicated process which can be expressed as “theory-methodology-formulation-medication-dosage” in TCM clinical therapeutics, showing how important for a formula prescription to have a specific herbal dosage (Zha et al., 2015). Basically for western medicine, these is a positive correlation between dose and toxicity. However, TCM at a large dosage tends to have good therapy efficacy with slight side effect (Wang et al., 1983). The dosage of Chinese herbals in clinical cases or experimental studies is usually at a relatively higher level than that documented in ancient TCM records (Peng, 2003; Sun, 2007). RR as an example, the dosage to treat cholestasis in clinical is more than four times the regular dose recommended in the Chinese pharmacopeia (Zhang et al., 2016). For now, the widespread explanation is that drug should be administrated to the patient with the correct disorder indications, otherwise it will produce dosage variety and individual detrimental effect (Zhao et al., 2015). As displayed in Table 5, dosage of constituents from SHXXT has a big range with no obvious rule to follow, it is possibly due to different tested animals or cells may have different drug sensitivities, but still need further clarification. Table 5. 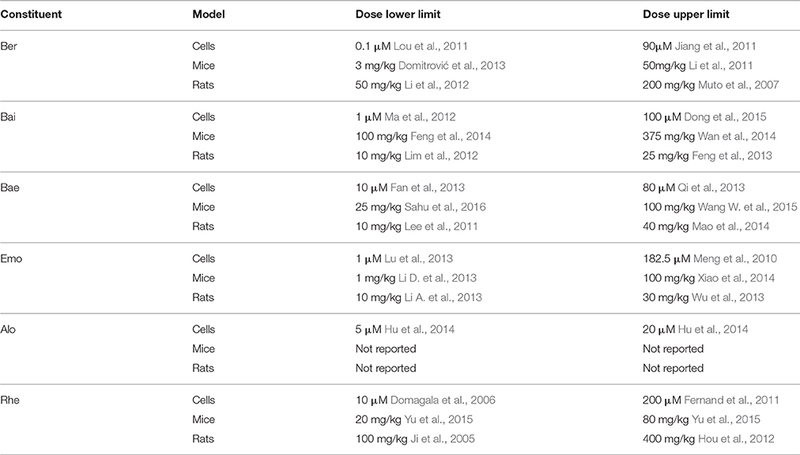 The dose range of SHXXT constituent used in-vivo and in-vitro. It is easy to find out not all the SHXXT constituents receive deep-enough investigation on their anti-inflammatory effect, the interaction between main SHXXT constituents and targets outside the nucleus get most focus. Besides, any drug elevating the absorption of Rhe, Ber, and Bae can be employed to promote oral bioavailability of SHXXT. Even though evidence shows P-gp, BCRP, and MRP really are inhibited while reports rarely cover the effect of SHXXT constituents on OCTs or SGLT. Hence, further investigation at these two levels is required to fully explain the mutual reinforcement relationship of RR, RC, and RS. JW: Prepare the manuscript; YH and LX: Search for the literatures; SL and YY: Draw the figures; XC and YZ: Do the summing work and accomplish the tables; WH: Polish language; XM and PW: Corresponding authors. This work was supported by the National Natural Science Foundation of China (Nos. 81073118, 81274111 and 81473419). ADM, adriamycin amycin; Akt, Protein kinase B; extracellular signal-regulated kinase; AMPK, 5′ AMP-activated protein kinase; Ang II, angiotensin II; AP-1, activator protein 1; ATF, Activating transcription factor; BCRP, breast cancer resistance protein; CaMK, Calcium/calmodulin- dependent kinase; CHOP, C/EBP homologous protein 10; CK, ginsenoside metabolite compound K; CMC-Na, caboxy methyl cellulose; CREB, cAMP response element-binding protein; Dex, Dexamethasone; Dox, Doxorubicin; DSS, dextran sulfate sodium; ERK, extracellular signal-regulated kinase; GSK3β, Glycogen synthase kinase 3 beta; HCM, hypercholesterolemic; HG, high glucose; HO-1, HMOX1heme oxygenase (decycling) 1; I/R, ischemia/reperfusion; IKK, IκBα kinase; IκBα, inhibitor of nuclear factor κBα; iNOS, inducible nitric oxide synthase; IRAK, Interleukin-1 receptor-associated kinase; IRF3, Interferon regulatory factor 3; IRS-1, Insulin receptor substrate 1; JAK, junas kinase; JNK, c-Jun NH2-terminal kinase; LKB1, liver kinase B1; LPS, lipopolysaccharide; MAPK, mitogen-activated protein kinase; MAPKAPK2, MAP kinase-activated protein kinase 2; MEK, Mitogen-activated protein kinase kinase; MRP, multidrug resistance associated protein; mTOR, mammalian target of rapamycin 2; MyD88, Myeloid differentiation primary response gene 88; NIK, NF-κB inducing kinase; Nrf2, Nuclear factor (erythroid-derived 2)-like 2; OCT, organic cation transporter; OGD, oxygen–glucose deprivation; PDTC, Pyrrolidine dithiocarbamate; P-gp, P-glycoprotein; PI3K, phosphoinositide 3-kinase; PMA, Phorbol-12-myristate-13-acetate; Poly(I:C), Polyinosinic:polycytidylic acid; PPAR-γ, peroxisome proliferator-activated receptor γ; Raf, RAF proto-oncogene serine/threonine-protein kinase; SAP, severe acute pancreatitis; SGLT1, Na+-dependent glucose transporter; SO, sham operation; SS, sodium salicylate; ST, sodium taurocholate; STAT, signal transducer and activator of transcription; TAK1, transforming growth factor-b-activated kinase; TLR-4, toll-like receptor; TNBS, 2, 4, 6-trinitrobenzene sulfonic acid; TNFR1, tumor necrosis factor receptor 1; TRADD, Tumor necrosis factor receptor type 1-associated death domain protein; TRAF, TNF receptor associated factors; TRM, epilepsy-like tremor; Tyk2, Non-receptor tyrosine-protein kinase 2; VSMC, vascular smooth muscle cell; WKY, Wistar-Kyoto; WT, wild type. Domagala, F., Martin, G., Bogdanowicz, P., Ficheux, H., and Pujol, J. P. (2006). Inhibition of interleukin-1β-induced activation of MEK/ERK pathway and DNA binding of NF-κB and AP-1: Potential mechanism for Diacerein effects in osteoarthritis. Biorheology 43, 577–587. Feng, J., Guo, C., Zhu, Y., Pang, L., Yang, Z., Zou, Y., et al. (2014). Baicalin down regulates the expression of TLR4 and NFkB-p65 in colon tissue in mice with colitis induced by dextran sulfate sodium. Int. J. Clin. Exp. Med. 7, 4063–4072. Hu, H. J., Han, M., Sun, R. H., Liu, B., and Wen, J. K. (2010). Baicalin inhibits VSMC proliferation and neointimal hyperplasia in rats. Basic Clin. Med. 30, 1252–1256. Ji, Z. Q., Huang, C. W., Liang, C. J., Sun, W. W., Chen, B., and Tang, P. R. (2005). Effects of rhein on activity of caspase-3 in kidney and cell apoptosis on the progression of renal injury in glomerulosclerosis. Zhong Hua Yi Xue Za Zhi 85, 1836–1841. Legendre, F., Bogdanowicz, P., Martin, G., Domagala, F., Leclercq, S., Pujol, J., et al. (2007). Rhein, a diacerhein-derived metabolite, modulates the expression of matrix degrading enzymes and the cell proliferation of articular chondrocytes by inhibiting ERK and JNK-AP-1 dependent pathways. Clin. Exp. Rheumatol. 25, 546–555. Li, Y., and Guo, C. (2010). The progress of modern pharmacological research of Sanhuang Xiexin decoction. Chin. Pharm. 21, 1048–1050. Peng, Z. F. (2003). Medicine theory from Yi Xue Zhong Zhong Can Xi Lu of Zhang Xichun. Chin. J. Basic Med. Trad. Chin. Med. 9, 62–65. Shang, W., Liu, J., Yu, X., and Zhao, J. (2010). Effects of berberine on serum levels of inflammatory factors and inflammatory signaling pathway in obese mice induced by high fat diet. Zhongguo Zhong Yao Za Zhi 35, 1474–1477. Sun, Q. X. (2007). The dosage of radix aconiti lateralis and its decoction method. Trad. Chin. Med. J. 6, 11–16. Wang, J., Wang, P., Yang, Y., Meng, X., and Zhang, Y. (2011). Intestinal absorption of aloe-emodin using single-passintestinal perfusion method in rat. Zhongguo Zhong Yao Za Zhi 36, 2393–2398. Zhang, Q., Wang, C. H., Ma, Y. M., and Wang, Z. T. (2013c). Preparative method of Sanhuang Xiexin Decoction and Fuzi Xiexin Decoction: research advances. J. Int. Pharm. Res. 40, 295–303. Zhang, Y., Zhu, H. X., and Guo, L. W. (2012). Intestinal absorption of berberine alone and in combinations by rats single pass intestinal perfusion in situ. Yao Xue Xue Xao 47, 233–238. Copyright © 2016 Wu, Hu, Xiang, Li, Yuan, Chen, Zhang, Huang, Meng and Wang. This is an open-access article distributed under the terms of the Creative Commons Attribution License (CC BY). The use, distribution or reproduction in other forums is permitted, provided the original author(s) or licensor are credited and that the original publication in this journal is cited, in accordance with accepted academic practice. No use, distribution or reproduction is permitted which does not comply with these terms.